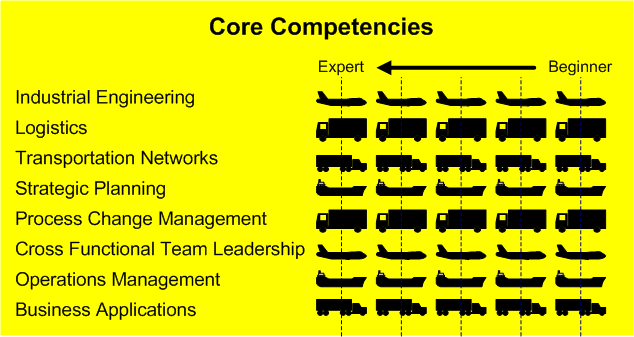 As a consultant, my objective is to deliver class leading transportation and logistics solutions to your organization. I have 34 years of experience working for a world-class enterprise while delivering intelligent, efficient, and cost effective business solutions. My background in Operations Management, Transportation Network Design, Logistics, Industrial Engineering, and Process Management represent a unique combination of disciplines. Combined with a solid background of leading and managing people, I bring a solid body of work to the table in both experience and wisdom. I am an experienced Transportation Manager who can help build your organization's foundation for future success. Was 1 of 5 senior managers assigned nationwide and tasked with oversight responsibility of the on-time transit of all UPS packages through the UPS ground and air networks. This included the management of the UPS Transit Map information system which documents the planned transit legs and corresponding transit times. Tasked with the responsibility of improving time in transit to meet customers expectations along with meeting the competitive challenges from both large carriers and smaller niche carriers. Managed and coordinated cost and service feasibility evaluations on all service change proposals for presentation to the UPS Executive Committee and Board of Directors. Lead project manager for operating plan development and implementation of origin and destination Alaska and Hawaii ground product. Liaised with UPS Product Design group to build cost effective operating plans to meet projected O.R. targets. Shared joint planning oversight responsibility of the development of customer-specific operating plans for large volume shippers. Leadership and Management Instructor at UPS New Full-time Supervisors Training School for 3 years. Managed a 300 employee sort and load operation in UPS's oldest operating facility in Southern California, processing an average of 80,000 packages per day, By evaluating and changing internal business processes, reduced payroll costs and operational up-times, meeting and exceeding planned monthly business goals frequently. Developed strong business relationships with management subordinates and hourly union employees, resulting in consistently high Employee Relations Index scores. Had region level oversight authority of the design, development, and deployment of the UPS Intermodal operating plans on the West Coast, integrating the movement of UPS Air packages into the UPS Ground and Intermodal networks based on day, weekly, and monthly cyclical requirements. Managed process changes to the UPS Transportation Network in order optimize network capacities, ensuring trailers were moving loaded in both directions in transportation lanes. This included changes dictated of seasonal volume levels as well as adhoc changes necessitated by network disruptions (inclement weather, highway construction, train derailments, etc.). Region level responsibility overseeing the development and implementation of business and operating plans and work measurement standards for all UPS Hub and Tractor Trailer operations in six Western states (CA, AZ, UT, NV, ID, HI). Region Coordinator for various UPS facility openings (1990-1992) – Developed design data for the hub and tractor operations, coordinated cross-functional support., and led the development of new plans and revision of existing hub and feeder operating plans. Region Coordinator for implementation of the new UPS 3 Day Select product. Developed the design specifications which called for the integration of UPS Air packages in the UPS ground network on a day of week basis. Industrial Engineering training manager at UPS corporate and regional schools. District level responsibility overseeing the development and implementation of operating plans and work measurement standards for all UPS Hub, Airport, and Tractor Trailer operations located in the counties of Los Angeles and San Bernardino. Worked cross-functionally with business operations managers and other functional groups to improve business processes, ensuring optimum cost effective performances, and maintaining UPS levels of time in transit reliability. I've known Mike for 7 years at UPS and found that he has a remarkable attention to detail, very people oriented and was a very dedicated manager at UPS. He always was looking for ways to improve service and always put the customer first. He is a tireless worker, who makes sure that every detail is covered and that everyone understands the plans. I highly recommend Mike for any position, he will be an asset to any company he works for. Mike Lee is the consummate logistics mentor and trainer. His knowledge of the UPS air and ground network and the ability to transmit it to others was a key reason for the planning success and operational efficiencies developed by the Pacific Region Hub and Feeder group. Despite his wide ranging responsibilities he was always willing to answer a question or provide advice on technical or planning issues. Recognizing that not all situations are easily solved “by the book” he demonstrated a creative and flexible persistence to problem solving that often became the accepted solution. We worked together through over 14 years of continuous growth and change and, regardless of the situation or urgency; he managed to remain professional and focused. Mike Lee is an exceptional friend and colleague with my unqualified endorsement. Michael was a dedicated individual who also took the time to help anyone learn the processes and procedures of the job as well as answer any questions with great detail behind the answers. Michael is a skilled manager to work with, who understands how to get things done with respect and tact. His people skills are top-notch and he is able to achieve goals because of his collaborative approach.